Katie Keys is one of the artists who inspired me to make “Fine Line”. So I am very excited about our new collaboration. Katie is a poet, writer, arts manager and advocate. We met when she was the CEO of Arts Access Australia, the organisation I now run. I was intrigued by her creative discipline to write a poem a day on twitter. You can follow her at @tinylittlepoems and enjoy her 140 character poems. Her conscious decision to keep creativity on her agenda whilst managing a national organisation with limited resources made me re-evaluate my own approach to my arts practice … and here I am. So now to the collaboration. I asked Katie if she would like to create a series of tiny little poems in response to my songs. I am delighted that she agreed. Here’s the first one in response to track 1: “Monsters”. There is always the danger that if I attend any event in a darkened room at the end of a stressful day, I will fall asleep. The Undercover Artist Festival kicked off in Brisbane’s Bille Brown Studio with the launch of Emma Bennison’s album, Fine Line. It was early evening. I got out of the taxi, rushed in. The stage was set. 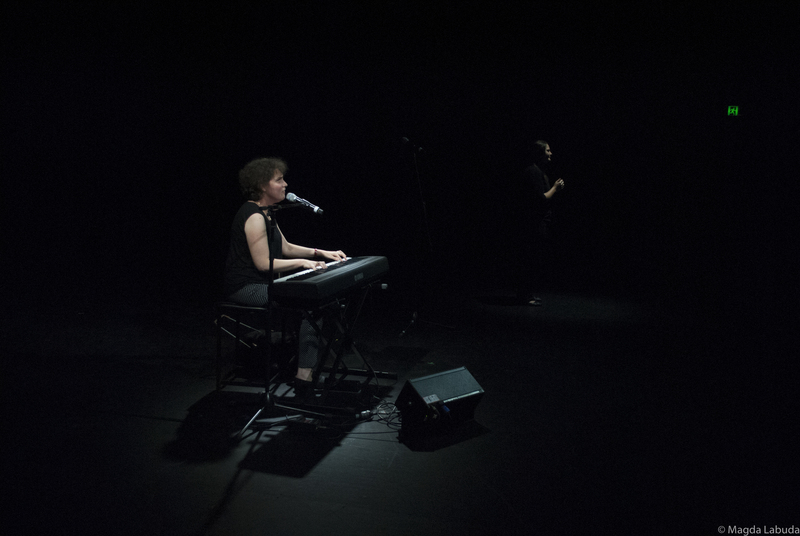 Minimalist, Chiaroscuro, Emma sitting at the keyboard, under a narrow stream of light, and the woman AUSLAN interpreter dressed in black, standing to the side, only her face and hands illuminated. The lyrics of the songs represent Emma’s journey over the past three years as the CEO of Arts Access Australia, a working parent, an artist, a sister, volunteer with Blind Citizens Australia, a disability advocate. She explains this is the first time she has written songs that honestly express her fears and joys, the highs and lows of her experiences, as opposed to writing what she thinks the music industry wants to hear. ‘Guilty’ is another example of this honesty where she writes about the feelings that overwhelm her when she leaves her family to travel. And I’m trying trying trying so hard not to cry. Just how badly I don’t want to go. I’m definitely not falling asleep. Emma is a singer/songwriter, a storyteller and nothing holds my attention more than a good story. She says, “I think it is time these stories were heard. Not only because they are my stories, but because I never hear songs about myself or others like me on the radio and I want to change that.” Fine Line is an album that challenges us to think about representation, the importance of role models and leaders in creating a more positive future for people who face discrimination, specifically people with disability. Wendel is on duty throughout the performance. A black, guide dog, he lays quietly in the shadows of the keyboard. Emma chats to us about people’s weird and wonderful responses to him and then sings, ‘He’s not Human.’ The song is funny and poignant. The audience laughs. Some of them are thought-provoking . . . Some of them I wonder, are you joking? Cause guess what? He’s not human! Emma’s love of singing developed at a young age. She participated in the Christmas and Easter choirs at church, loving the harmonies and often sang the descant parts. She has fond memories of singing ‘Good King Wenceslas’ with a boy soprano, and for two years running performing ‘The Little Drummer Boy’. “It actually became quite lucrative at one point . . . a stranger would come over to me afterwards and press a $100 note into my hand telling me to buy a present for myself.” She has a Bachelor of Music from the University of Queensland and would like to continue writing, touring and performing. With the launch of Fine Line she hopes people will hear and enjoy her music, and that they will understand more about universal access. The album cover is black and white, minimalist, like the stage design. The songs too offer us dark and light, depth and subtlety, expressing the pathos and the shadows, and always the humour of life. I am hoping for and looking forward to the Fine Line tour, Emma performing in festivals, and mainstream venues, accompanied by a band, and backing singers. They’re moving the mountains that have stood in our way for so long. All proceeds from the launch were donated to the SAFE Fund – providing professional development grants and an annual award to Queensland artists with disability. Gaele Sobott is a writer and producer, disability advocate and director of Outlandish Arts. Labuda for the photography. To check out more of Magda’s work, visit http://www.magdalabuda.com. 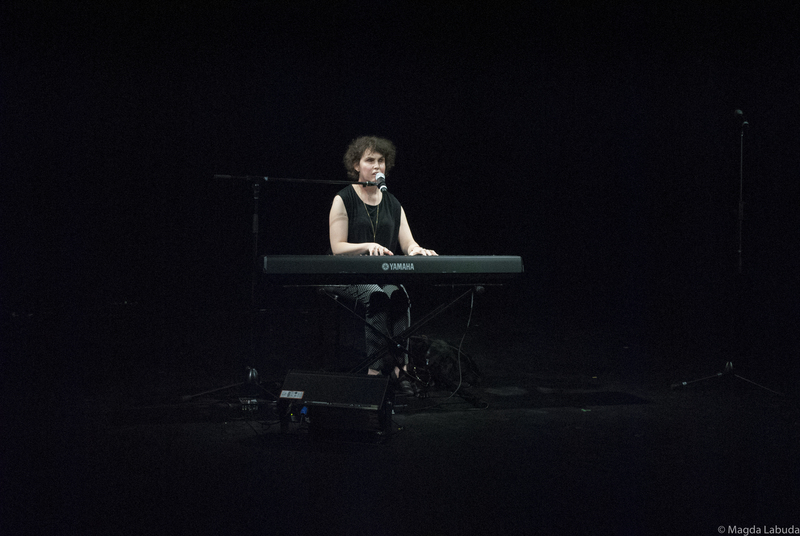 On 9 August, Hobart singer/song-writer, Emma Bennison will launch her new album with a free event in Hobart. The album, “Fine Line” makes history by being fully accessible to people with disability. Fine Line, Bennison’s second release, combines stunning vocals and honest lyrics which offer a poignant window into her experiences of walking the fine line, as a disability rights advocate, a mother, a sister and a parent. In this interview on Blind Citizens Australia’s New Horizons program, Emma talks with steve Richardson about what inspired her to write the material for the “Fine Line” album.